Here is my third entry for the 25 Motif Challenge. 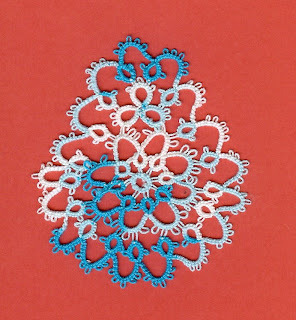 It is from the Priscilla Tatting Book No. 1. I saw this motif and knew I was going to have to make it. It is unique and I think changes could be made to make it more tatter friendly. Each round is cut and tied. I think we could use two shuttle and eliminite at least one of the cut and tie rounds. The clover at the top has to be done seperately, as far as I can see and then the final round to join them all together smoothly. I am sure I will be trying this one again. It has been cold here all day last I checked it was just 4 above and that was just a dusk so it will be going down below zero again tonight. I am so glad I am retired and do not have to get out at 5:30 in the morning to go to work. But on a brighter note it was 52 above zero at my daughters in Alaska today. Can you believe that 100 degrees difference in just a week. I just can't imagine that weather change. She and her husband were on their way to check out a new puppy. She is a sister to the one they just lost. I am sure my daughter will fall in love with her and bring her home. The dogs are a lot of company while her husband is off on his work hitch. Another bit of nice work! This is one of the 1st motifs I made when I learned to tat. I didn't know how to do split rings or chains or work with 2 shuttles yet, so I agree - it could be updated considerably! I think you can work the whole thing in one 'hit' if you know how to do split chains and rings. Intriguing. Well done. Thank you to everyone who responded. I do know how to do split rings but have not attempted a split chain yet. I really appreciate you comments and suggestions. That is a pretty motif! You did an excellent tatting job! I do agree with Jane (I'm not so good at figuring up ahead in advance), but after looking, I can see where even just using split rings would work, at least taking it down to two rounds. Jane is right with the split chains, it could be done in one hit. Still a beautiful motif! I am happy for your daughter. I can see where the dogs would be great company. Those are long periods to be alone. I think you all back east are getting the weather we had in Dec. The 'below' zero and snow. Our lasted for about 3 weeks or better. Hope yours don't last that long! Keep warm and stay safe!